This design comes with a matching 404 page for users who reach an unrecognised site url. Below is a screenshot, and you can see it live here. Shape5 Vertex uses articles to display a 404 page rather than a hard coded php file that's hard to modify, like many other designs do. This means you can modify the look or wording of the page very easy without having to modify a file, and it keeps all of your site navigation in tact for ease of use for your site viewers since it uses the template and not an external file. It's as simple as editing a page through the CMS to make any desired changes, or simply leave it as shown! 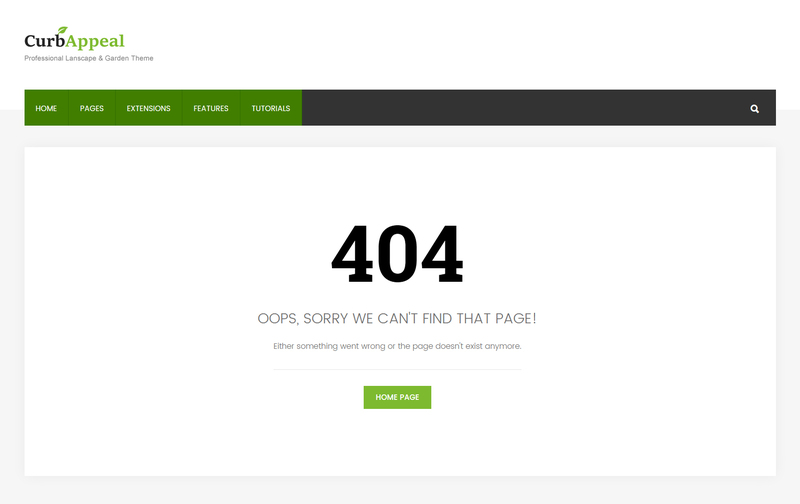 Our site shapers come pre-packaged with the custom 404 page. If you are setting up a brand new site without a site shaper the easy follow instructions are below the screenshot on this page. These instructions are for non site shaper installs. If you're installing with a shaper just make sure to leave the page titled "404 Error Page" published and you're done! If you are installing a fresh installation with no sample data simply create a page and make sure it's titled "404 Error Page". It must be given this name for the Vertex framework to identify the page needed to be used. You can put any content that you want on this new page, or we've provided the code used on this demo below. Save the page to any category, just make sure it's published. That's it, you're done! The site will now redirect to this page when ever an unrecognised url is detected.